I have been sent some things to review, and instead of spreading these things out, I'm just going to do a couple of posts and give the stuff away. I'm not the best reviewer, because I like pretty much everything (except crows), but there are a few things that I don't mind reviewing and passing along (books being one of them). Most people that race triathlons are everyday people. A small fraction of the people who race in Ironman are able to make a living doing it, but most are what I consider normal, everyday people. Okay, maybe not so normal. The amount of time, money, effort and sacrifice it requires to complete the 2.4 mile swim, 112 mile bike and 26.2 mile run on race day could rival some full-time jobs, and it is amazing to me that so many people take on this challenge. Most of the people who complete an Ironman balance work (those bikes and race entry fees are pretty expensive), family, and anywhere from ten to thirty hours a week of swimming, biking, running, and strength workouts. It is a big commitment, and for most people, it is simply out of reach. 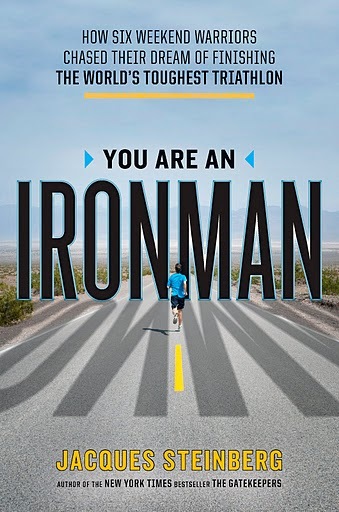 In the book, You Are An Ironman, Jacques Steinberg follows six people as they train to complete an Ironman and he focuses on the challenges and triumphs that occur during the training and the Ironman race itself. This book is more about the background stories of the participants than the training specifics. Among the athletes that the book follows are a businessman on the verge of a heart attack; a schoolteacher eager to set a good example for his daughters; the director of a fitness center at an Air Force base who survived a bout of cancer; and two California mothers, one who had dreamed of becoming a runner since she was an overweight young girl and the other who signs up for the Ironman on a dare. Of special interest to me was the story of Scott and Leanne Johnson. Scott has cystic fibrosis and was the recipient of a double lung transplant. Their story is very inspiring and gives me so much hope. I love watching the Ironman Hawaii coverage on NBC every year. They stick to a formula, a formula that works, mixing coverage of the pro race with compelling stories of age-groupers, athletes that the average viewer can relate to. These personal interest stories are always the ones that get me. I remember watching the coverage of the 2008 race and being so inspired and motivated by some of the stories, that I signed up for my first Ironman. The training and the race itself was an amazing experience, and while I would rather push my running limits at this point than compete in another Ironman, I'm not ruling out another go at the distance someday. The personal stories in this book are similar to the stories of the people highlighted in NBC's Kona coverage. They will inspire you, and may even have you pressing that "Register" button. I was sent this book from the publisher, and I would like to pass it on to one of my readers. If you are interested in this book, please let me know by leaving a comment below. You can also enter this contest by joining the "Members" list to the right (because membership has its privileges), so make sure you are a subscriber by pushing the "Join this site" button. I'll announce a winner next week. You can order the book from Jacques Steinberg's website. I love reading your blog and would love to read the book! I just joined, and would love to read it since I am working to become a (half) Ironman. I'm a follower and would love to check this book out! I always like good stories! It's too expensive to send a book here, but I need to know...what's wrong with crows?!!!! I'm interested, and would return it to the Dax library when I am done. I would love to read this book! I started running with the San Elijo Couch to 5K running group last November and could barely run one minute during that first workout. Now, less than a year later (and 30 pounds lighter), I am completing my first full marathon this coming Sunday in Long Beach. Along the way I have read a few books about running and have been inspired by many stories. I am setting my sights on a sprint triathlon next and a book like this would definitely inspire me. Pick me! Pick me!! :-D I would definitely donate the book to another worthy soul once I was done. Stephie -- I don't know what it is about crows, but they freak me out. They're too smart, and I saw The Birds at a young age, so that probably has something to do with it. Amanda -- I love stories like that. Good luck on the marathon. You're awesome. Good luck to everyone. I'll pick a winner at the end of the week. New follower :) and would LOVE LOVE LOVE to read this one!! I follow you and this book is on my to-read list! Thanks for doing this give away. hey Dax, great pics and blog; i'm interested in the book as well. I love reading the stories of runners who overcame and their paths. thanks for the blog. I would love to read this book! One of my goals is to complete an Ironman by my 40th birthday (I have 3 years to go). I have a hard time managing life and training so this would be a great guide! A friend of mine just finished the book as well, I would love to read it! Sounds so inspiring! Thank you for sharing your blog. I'll be happy to read the book. Dax - It's been a long time. How nice of you to donate this book. I've been sidelined for the better part of the last couple of years with health challenges. With any luck I'll be able to join you and the group for runs, bike rides and swims at some time in the future. Right now the best I can do is to take it easy physically and to live vicariously experiencing good books and movies. I'm certain this book would be an inspirational good read. If given the book I'll definitely pass-it on after reading for others to enjoy. Hey Dax, Great Running with you the other day. It would be cool to check out the book. Would be great to get to read the book. Thanks for doing this contest to pass it on. I recently read about this book in another post and would LOVE to read it. I am a barely finishing, two time Ironman distance racer (VINEMAN), but have yet to hear those words "You are an Ironman". Dax, it was so fun running with you on Sunday. I look very forward to the next time we hit the trails together. I'm a new follower and I would LOVE, LOVE to read this book. I'm running my first 1/2 marathon at the end of this month and recently purchased a bike to gear up for my first tri. Can't wait to read this book, either as the recipient from you, or purchasing it myself. Thanks!